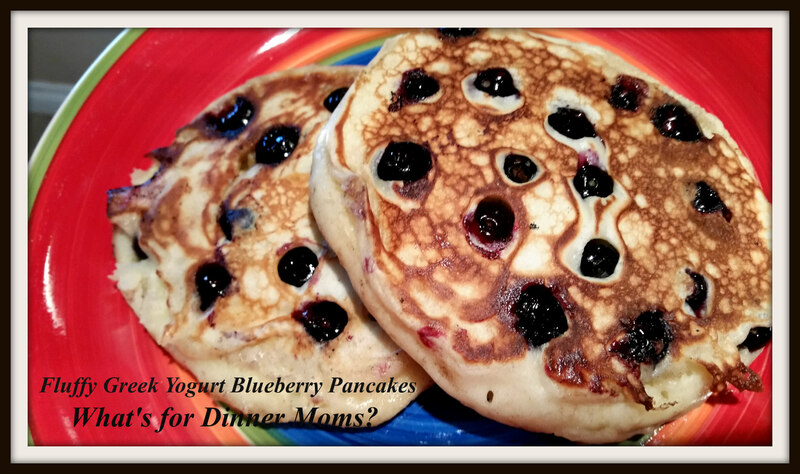 Fluffy Greek Yogurt Blueberry Pancakes – What's for Dinner Moms? It is the beginning of blueberry season here in Michigan. Which means in our CSA (Community Supported Agriculture) share we are getting 2-3 pints of blueberries each week. My children love to eat them right from the container but I save one out just to make blue berry pancakes with. As I was looking through my refrigerator I realized we had a container of vanilla Greek yogurt. I was excited to make some light and fluffy pancakes for dinner. I made these pancakes a bit larger than normal, using a 1/3 cup scoop rather than a 1/4 scoop, and did not mix the blueberries into the pancake batter as I don’t like blueberries (or anything) in my pancakes and they tend to turn the batter a gray/purple color if the berries get mashed in the stirring. Instead I lightly sprinkled the blue berries over the pancakes once they were on the griddle and lightly pushed them into the pancake so when I flipped them they wouldn’t stick up too much. This recipe made 15 pancakes when I made it and they are so filling we each only ate 2 for dinner. This left us with some delicious leftovers for breakfast the next day or two. They heated up wonderfully in the oven or microwave and my son even ate his cold. Serve the pancakes with your choice of toppings – butter, syrup, fruit or powdered sugar. Serve with a fruit salad on the side to complete the meal if you like. In a large bowl mix together flour, baking powder, granulated sugar and salt. Make a well in the center and add oil, eggs, Greek yogurt, and half and half. Stir until just mixed through. There will be a few lumps. Place a non-stick griddle over medium-low heat. Place 1/3 cup amounts of batter onto the griddle. Sprinkle pancakes with blueberries. Press blueberries lightly into the pancakes. Flip pancakes when bottom is browned and golden. Allow pancake to cook through. Remove pancakes to a warmed plate in a 170 degree oven until ready to serve. I got to try these! Thank you! Hope you like them if you do! Thank you! Looks yummy too! Another such a great recipe!!! It’s nearly 8 am on a Sunday over here and I woke up dreaming about pancakes. Seeing your pancakes I think it’s a sign that I need some pancakes in my life 🙂 these look delicious! Thank you! I hope you get your pancakes! These look amazing! We have about 10 blueberries growing in the garden at the moment (all my blueberry plant manages a year!) I may have to buy some to add to them and make this tomorrow! Thank you! I passed a blueberry fruit stand today and thought about getting more for more pancakes. A superb recipe, Marci. Michael loves making pancakes so I am saving this one.
! Seeing your pancakes I think it’s a sign that I need some pancakes in my life 🙂 these look delicious! Thank you. Pancakes have grown on me over the years. Never used to like them but can now appreciate them. Seeing your pancakes I think it’s a sign that I need some pancakes in my life 🙂 these look delicious! Hope you like it!